With Unlimited Catalog Scroll, your clients no need to seek the 'next page' button on catalog products list page, just scroll down the mouse wheel and the next page will appear. And, to return to previous pages - just scroll up without clicking the 'previous page' button as usually. 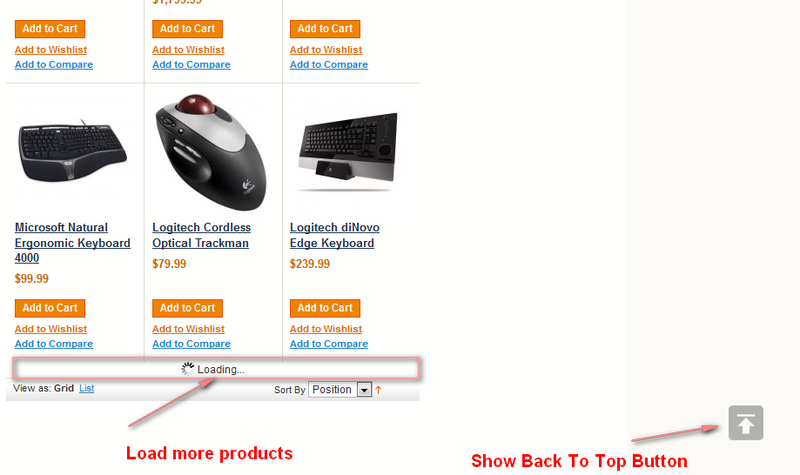 With Magento Unlimited Catalog Scroll customers can easily scroll between pages, up and down. It saves customers time when viewing products because the next page will be loaded automatically when scroll bar reaches 2/3 part of browser's heigh. The auto appearing is good way for customers and makes it much easier to surf the product pages on my website and find exactly what they looking for quickly and conveniently. A must have for any site with more than one page full of products in any category. I would like to compliment for this extension as to provide more convenience to the customer this is the best solution by OnlineBiz. I recommend this extension which works perfectly. The support is very qualified and solved my problem very quickly. Really good extension and great support, thank you. Chose this one among others just because it is from OnlineBiz. Great extension likewise all other your products. We use several and love them all. Installed this extension very quickly. Everything is clear and all the features work the way they should. Scrolling down the page is much better than flipping through pages, great! 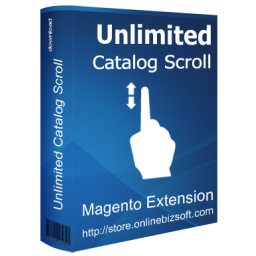 Unlimited Catalog Scroll extension is great extension and they have wonderful support, very co-operative and responsible. I will love to deal with them in future and also recommend there support and product. This extension makes page loading so much easier. While we could have written our own infinite scroll, this saved us a ton of time. Highly recommended.